Principles of Marketing Summary Hey everyone, this is my summary of the book Principles of Marketing the 17th (global edition) by Kotler. It includes chapter 1,2,3,5,7,18 (I followed the exam material from my university). All information is from the book and images contain sources. I hope that I can broaden your knowledge of the Principles of Marketing and help you with a good grade ;). Hope it helps! 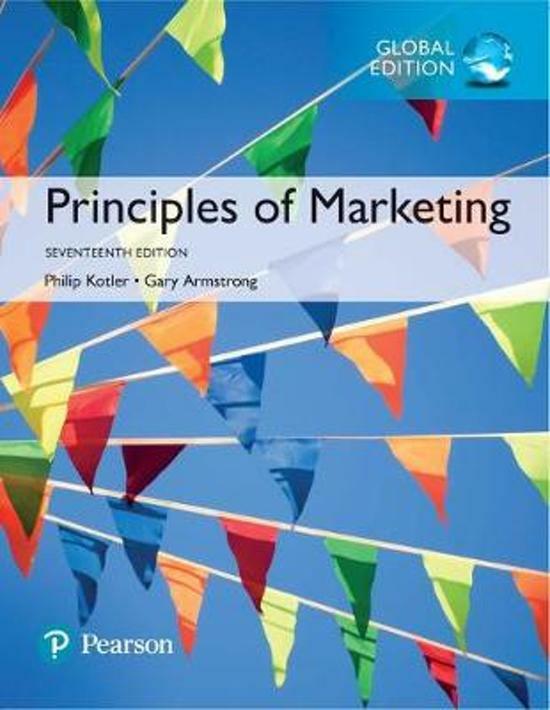 Book: Phillip Kotler – Principles of Marketing, European edition, Summary Y2Q1 A summary of the lessons and lectures, the marketing course, in the first quarter of year 2 of the course \'International Business and Management Studies\' at Avans Hogeschool. The book used is \'Phillip Kotler - Principles of Marketing, European edition\'. Summary Global Branding Y2,Q1 This document provides you with everything discussed during the lectures and training. So, not only the slides/figures and pictures. Additionally, the explanation of each and every slide. This document also includes the self-test with answers. In short, this is everything you need for the exam. Summary marketing, including sample questions (IHM year 1, module Guest Experience) Complete summary of marketing in the module Guest Experience (IHM year 1). This summary also includes really useful sample questions (open and multiple choice) including answers. I summarized everything (Principles of Marketing, intercultural marketing, sustainability) and learned with this summary, which got me an 8,6 on the test. Marketing Communications This document highlights the main components comprised in the promotional mix. Pricing This essay describes the main pricing methods which a company may adopt, and gives scenarios when each pricing method may be used. På denne side finder du referater, notater, studieguider og meget andet for studiebogen Principles of Marketing, skrevet af Dr. Philip T. Kotler & Gary Armstrong. Referaterne er skrevet af de studerende selv, som giver dig et godt indblik i hvad der er vigtigt at studere i denne bog. Emner som IBMS, Marketing, principles of marketing, marketing, Kotler, Stenden, Principles of marketing & MARKETING tages der god hånd om.